Can you believe these things happened in Minnesota? Rocks can tell us a lot about what happened in Minnesota long ago. They show a history of volcanoes, seas, mountain ranges, earthquakes, and glaciers. Let's take a look at how the rocks show us that these events happened! Volcanic action creates lava and ash. The rocks along Minnesota's North Shore of Lake Superior, for example, were created from cooling lava. Bentonite clay in southeastern Minnesota was formed from volcanic ash. Besides eyewitness accounts of earthquakes in Minnesota, geologists look at rock layers for evidence of these events. They can see that different layers do not always lay flat on top of one another. There are folds and breaks. The shifting of the earth (known as earthquakes) caused the layers to move. Geologists can also see evidence of earthquakes in Minnesota with the Midcontinental rift. This rift, running from Minnesota to Kansas, is the result of the middle of the North American continent splitting apart. Rifting is the opposite of a mountain range forming. 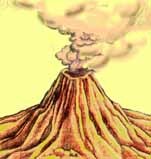 Instead of rock material being pushed up to form a mountain, rock material falls down when a wide split in the land is made. Molten material from deep within the earth rises up to fill in the gap. Geologists see patterns in rock layers and fault zones showing that rock layers were pushed on top of other layers. Geologists see this same pattern today with the Rocky Mountains. So, they hypothesize, these layers of rock were once mountains. But what happened to them? The mountains have been worn away by millions of years of exposure to rain, gravity, wind and ice. Geologists know Minnesota was once covered by seas since they have found limestone formed from pieces of shell; sandstone from beach sands; and shale from deep water mud. The Mesabi Iron Range marks the shoreline of an ancient sea. Fossils of shells, fish and other marine life have been found along parts of the Mesabi Iron Range. Glaciers left behind many signs of their existence in Minnesota. Deep scratches are found on slabs of rock, showing that the glacier passed by. Large amounts of sand, gravel, and rock were left behind when the glaciers began to melt. This material is called glacial drift. In Minnesota, glacial drift covers the bedrock (the solid rock under the crust of the earth). Since the bedrock is buried under the glacial drift, geologists cannot look directly at it to see what kind of rock it is. Many features in Minnesota's landscape, such as most lakes, hills, and ridges, were formed by glacial activity. The surface of our earth is still changing! The wearing away of the surface is called erosion. Erosion constantly attacks the land by wind, water, frost, and temperature changes. Bedrock breaks into big rocks, and big rocks break into small rocks and soil; rocks and soil are moved to different locations, usually by running water. Our land is being eroded and changed everyday. How can we tell this is happening? We see dust in the air. Streams have muddy water. Potholes appear in our streets. These are all signs of erosion.